There are 4 reviews of Precious Oud . Apparently, you can just call anything an Oud now. Misleading title aside, Precious Oud isn't a bad perfume. It's got a big loud slug of waxy tropical ylang ylang drenched in in banana and coconut, all over a better-than-average pink pepper "fruitchouli" base with hints of creme soda and chocolate. After a few minutes to settle, it stays linear and lasts forever, slowly losing volume over time. If you can imagine a neutered version of Tom Ford's slutty Black Orchid with the floral skank replaced by a familiar-smelling sweet pink pepper base, that's essentially what Precious Oud smells like. Oh, and I can't smell any oud. The sad thing is that if they had named this "Tropical Ylang" or something similar, it probably would have sold better than it will as a disappointing non-Oud with a name that lies. The oud in this is pretty much snuffed out by the tuberose (which snuffs out most notes actually) and the peppers. 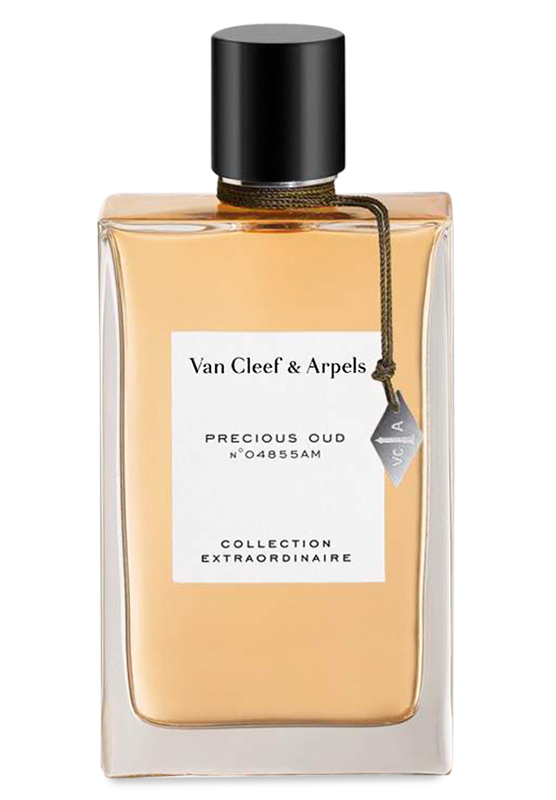 I think it works great and Van Cleef have almost serendipitiously produced a lovely juice. "How COULD I blind buy this?! It smells overwhelmingly flowery in an impolite way, NO finesse/subtlety, NO elegance, just an in-your-face kind of headache generator. I imagine this is what an Italian woman (aged 50-something) with too much money and no taste smells like." For the past four weeks I've gradually changed my mind. From one star and on "swap list", to three stars and on "keep list". The opening is still somewhat vulgar: a tuberose so loud I can only discriminate the bergamot. Frankincense? Hm... Maybe if you know it's there. Pink pepper? I can't discern it at all. The first 30 minutes are not very nice, and since sillage is superb you unfortunately can't get through the initial half hour without being aware of what's applied to your wrists. Then: about 1,5-2 hours of flowers; in my opinion a bit boring and quite heavy. The dry down 2-3 hours after application is where you want to go, and it's indeed worth waiting for. The tuberose fades and gives room for a jasmine that is more like an airy presence than a flowery smell. You perceive a "clean" patchouli, lovely vetiver and wood (apparently sandalwood). I'm to "new" in perfumery to know what a well-done sandalwood should smell like, so unfortunately I can't tell you if it's particularly beautiful, I just know I like it. "Oriental notes" - yes, but not obtrusive. After 8 hours the perfume is nothing more than a mysterious purple tone. This purple dry down is what I like most with this perfume. I wish the patchouli had been earthy instead of clean, and that the oud had been present: after all - it's named "Precious oud" and oud is what I wanted. Maybe the name is one of the major problems with this fragrance, "Precious tuberose" should have been more suitable. Frankly a disaster in my opinion and another failure among the new Van Cleef&Arpels' new issues. Tons of tuberose over a bombastically sweet dust of synthetic balsams and resins. The note of audh is other than woody or medicinal since it's just detergent and turns the scent out heavy and laundry as a soapy bath foam. The smell is unlike than natural and so far from the niche olfactory value. The chemical oudh is flanked by aldehydes, pepper and incense in a sort of hyper sweet, soaring and almost disgusting gassy cloud. I catch just a darkening hint of patchouli, a touch of hesperides at the beginning, may be a pattern of musk, some lymphatic cool whiff (the unique element of naturality may be) and nothing else but a disgusting floral creaminess (finally greasy, penetrating and almost acid) a la Jacobs' new feminine fragrances. Where is the strict and conservative renowned balance of the brand? Who is managing it nowadays? There are no member images of Precious Oud yet. Why not be the first?